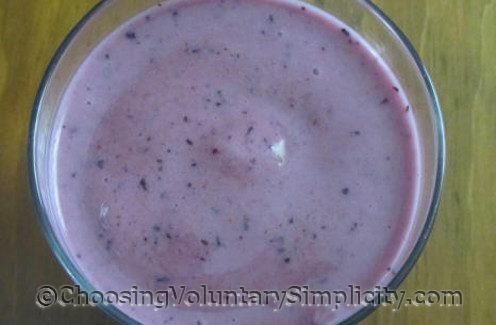 Combine the ice, yogurt, and banana and blend at high speed until smooth. Add the blueberries and blend at low speed for about thirty seconds. Stir, pour into glasses, and serve immediately. Blend at high speed until smooth. Pour and serve. In both of these recipes I use unsweetened yogurt… we prefer the whole milk yogurt we make ourselves because it is so thick, it is almost like Greek yogurt, but any type of yogurt will work. The blueberries I used today are ones we picked ourselves and froze, so I added them to the blender in their frozen state. We wanted something really, really cold so I used milk AND a frozen banana AND frozen blueberries AND ice and the smoothies were very thick. I made these for a family gathering today and everyone loved them. I made some with ice frozen bananas and frozen blueberries and they were almost like ice cream. So good. We have several high bush blueberries growing on our property and I’m always looking for good ways to use the blueberries. I know I’ll be making these smoothies alot. Btw we love your blueberry cake. I love the thickness of the smoothy made with all those frozen stuff. My kids like it better than icecream and I like that a lot!